A Washington state agency has sued a Texas-based railroad for not reporting hazardous spills at it transports oil through the state. A state regulatory agency has slapped BNSF RAILWAY, a Texas-based railroad company that's been transporting an increasing number of volatile shipments of oil through Spokane, with a $71,700 penalty for not promptly reporting numerous hazardous material spills. 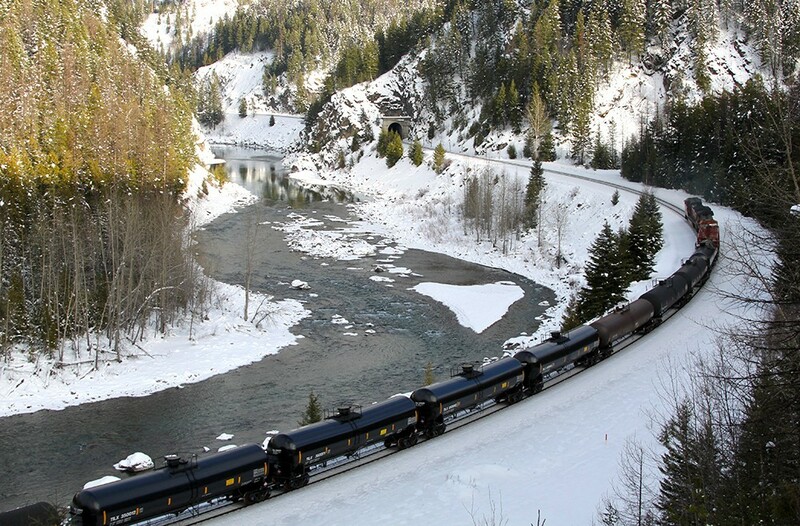 The Utilities and Transportation Commission, which overees railroad safety in Washington state, approved the penalty on Monday for failing to report releases of dangerous materials, including crude oil, to regulatory authorities within the time frame required by law. The order approving the penalties also requires BNSF to file a document describing the best practices the company will adopt going forward to stay in compliance. Under state rail safety rules, railroads must report the release of any hazardous materials to the Washington State Emergency Operations Center within 30 minutes. In March, a complaint was filed against the company that alleged BNSF failed to report the release of hazardous materials within the required time period. As of this Tuesday, Washington U.S. Sen. PATTY MURRAY was preparing for a vote on something both liberals and conservatives had been demanding for years. No Child Left Behind was on its way out. The Every Student Succeeds Act was on its way in. "The Every Student Succeeds Act will put an end to the one-size-fits-all mandates of No Child Left Behind," Murray, a creator of the legislation, said on the Senate floor Tuesday. "Our bipartisan bill will also reduce reliance on high-stakes testing, so teachers and students can spend less time on test prep and more time on learning." In 2001, No Child Left Behind also was a bipartisan bill. It required an increasing number of students to pass state standardized tests in each school. If any given school didn't show enough progress, they'd be labeled "failing" and face sanctions. But by 2014, the No Child Left Behind standard had risen so high that if a single student failed the test, the school would be labeled "failing." The Obama administration responded by giving states conditional waivers. The Washington State Legislature, however, refused to abide by the condition that the state use standardized tests in teacher evaluations, and lost its waiver. The Every Student Succeeds Act gets rid of waivers and allows states to work with districts to design their own goals for student achievement, with special attention given to the bottom 5 percent of low-performing schools. Rep. Chris Reykdal, D-Tumwater, running for state Superintendent of Public Instruction next year, says the bill correctly gives more power to states, while keeping the important role that the federal government plays in making sure low-income and minority students get the education they deserve. While he was incarcerated in 2013, Danny Lee went 10 days without his MEDICATION. He filed a lawsuit claiming that the Spokane County Jail denied him the medication he needed for bipolar disorder and other impulse disorders. He and the county reached a settlement on Tuesday for $50,000. "What would have happened if that was heart medicine or diabetes medicine, and he were to expire?" says Robert Lee, Danny's father. Robert Lee won a settlement a few months ago regarding a public records request he filed regarding the same incident. The county did not give the correct information, and he received $28,000 in the lawsuit. "[Danny] felt like it wasn't enough, not only in the monetary way, but in the way that they don't have to follow through with stuff inside the jail," Robert Lee says. While there wasn't a court order, the jail has made some changes, says Jeffry Finer, a lawyer at the Center for Justice and Danny Lee's representative. The jail has upgraded to an electronic record-keeping system at the Geiger Corrections Center and an online form to streamline the process of requesting medications, and the jail is working on acquiring more nurses.